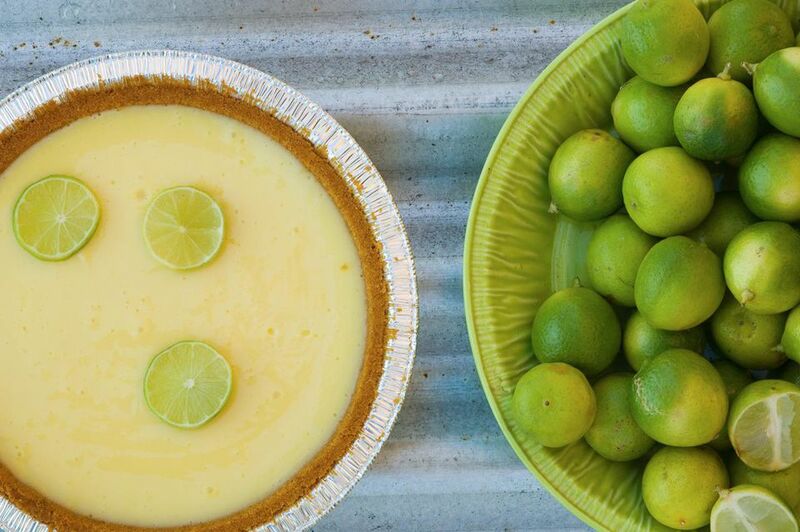 Key lime pie is famous around the world. It is a very simple custard that is easy to make at home. Fresh is preferable, but if you cannot find fresh Key limes, you should be able to find bottled Key lime juice in the canned aisle near the lemon juice. This could not be simpler to make. The main time factor is zesting and squeezing all those little Key limes, but it is definitely worth it. Remember to zest the limes before squeezing the juice. Place egg yolks and lime zest in a nonreactive bowl and beat on high speed about 5 minutes, until the mixture is very glossy. Add sweetened condensed milk in a steady stream and beat until thickened, another 3 to 4 minutes. Reduce mixer speed to low and add Key lime juice, beating only until combined. Pour the lime custard into the prepared cracker crust. Bake about 10 minutes until filling has barely set. Remove from oven and let slowly cool until it is room temperature. Refrigerate. Place the Key lime in the freezer about 15 to 20 minutes before serving time. Slice and serve with a large dollop of whipped cream.